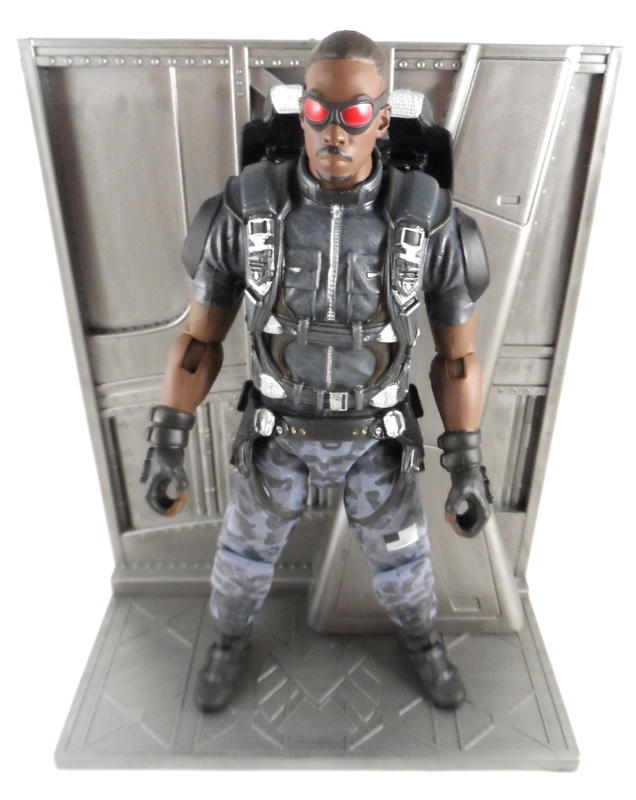 Marvel Select’s Falcon from the movie Captain America The Winter Soldier hit comic shops yesterday and we were able to get our hands on one. 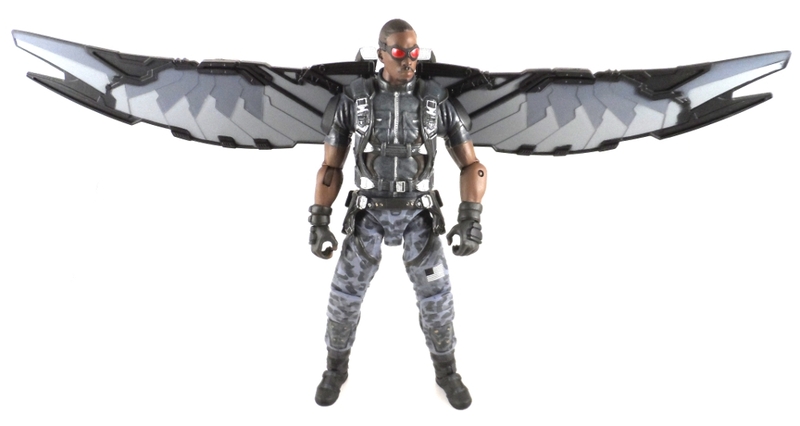 Read on to see if this figure soars or should have his wings clipped! 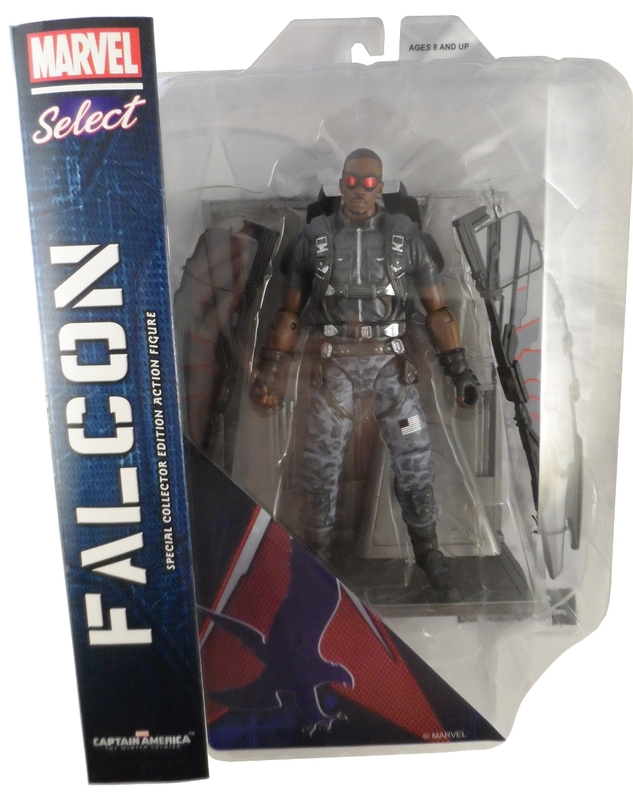 Falcon comes packaged in your typical Marvel Select packaging inside a bubble on a wraparound card. 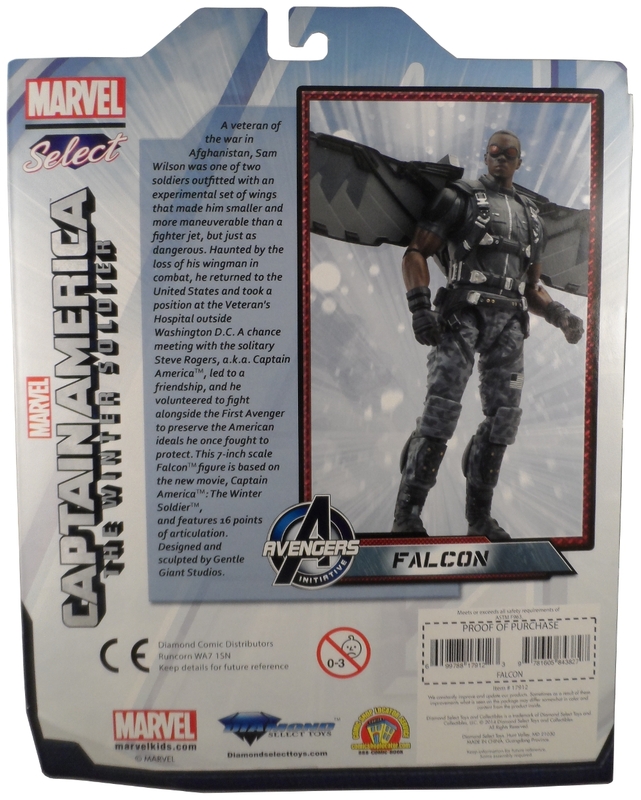 The back of the card has a bio about Sam Wilson, AKA: Falcon and mentions a little about the figure itself. 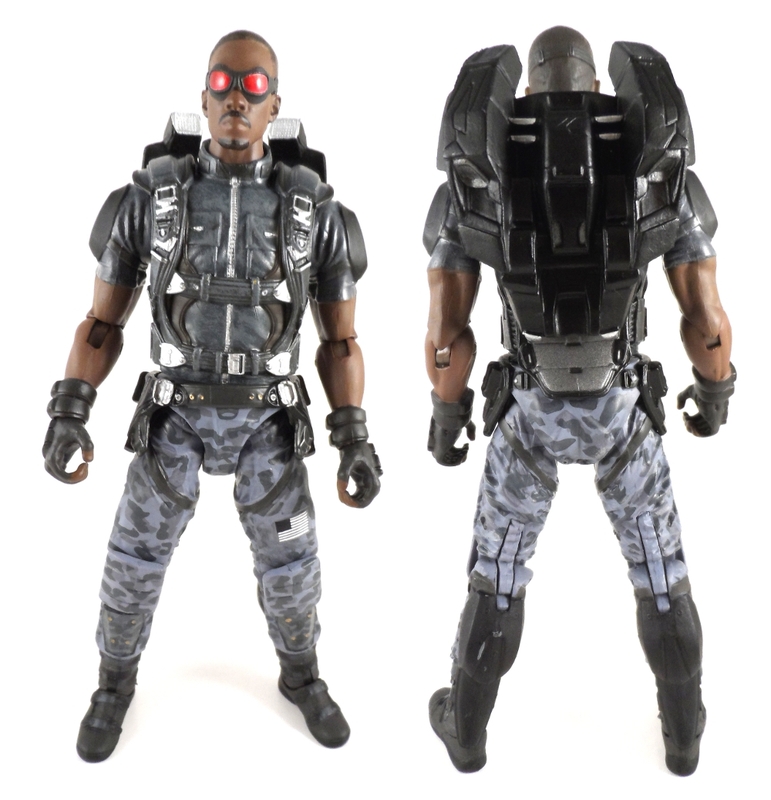 Falcon is well detailed and stands just over 7 inches tall. 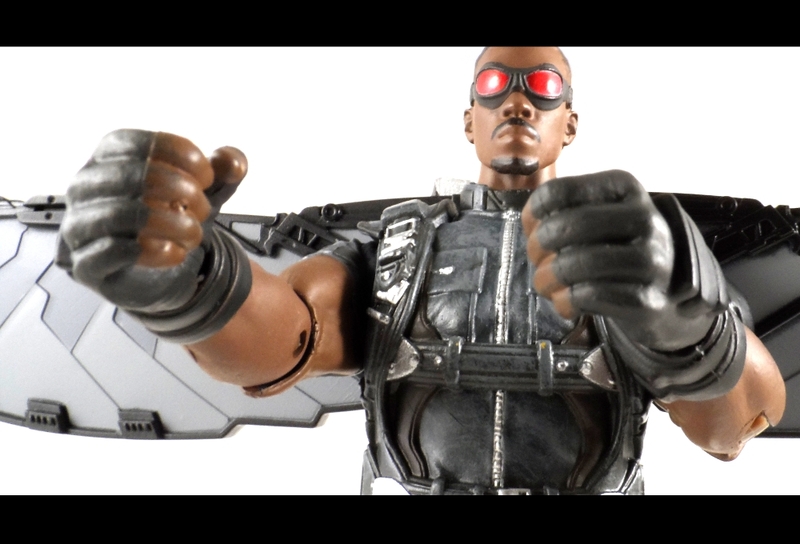 Falcon’s gear (Goggles, Pads and Flight Harness) are all molded on. Some of the pads that lay over articulation points (like the hips pads) are made of a softer plastic to give way a bit to the articulation. 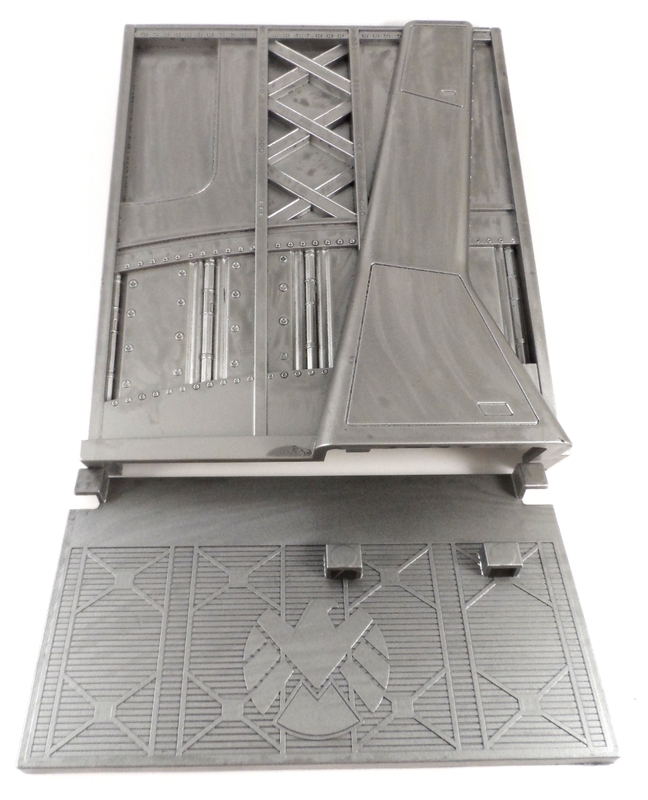 Falcon comes with a display backdrop that looks like the side of some aircraft hull or maybe a bunker wall. The floor has a Shield logo molded on. 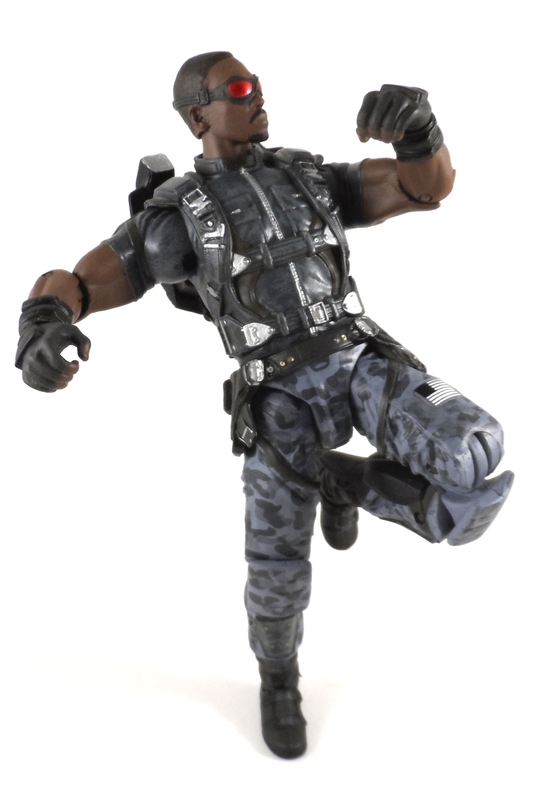 There are no footpegs to mar the Shield logo on the floor, but that doesn’t stop Falcon from being able to stand on it. 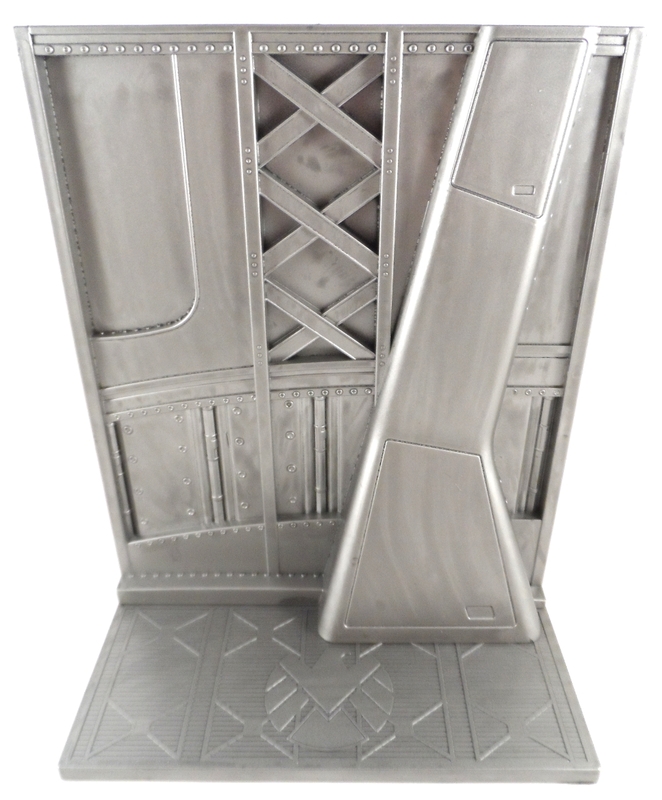 The backdrop can slide apart for easy storage. 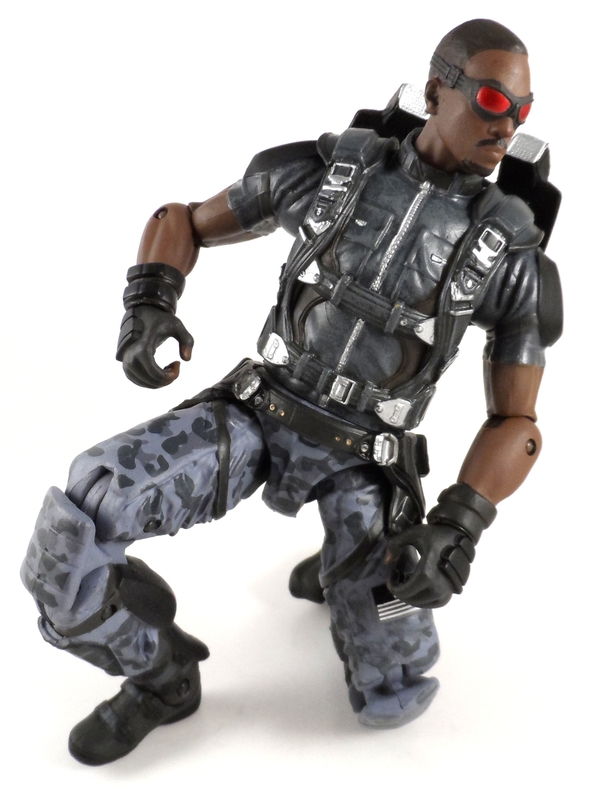 The packaging says the figure has 16 points of articulation (It only comes out to 16 if you count just the joints, if you count the different ways the joints move (IE: a Swivel/Hinge elbow counts for 2 POA) then you get an impressive 26 POA) This allows Falcon to have a great range of motion. The wings don’t move but they do have an impressive 13 5/8″ wingspan. I do have a couple of nit picks with this figure. The first one being the ankles. 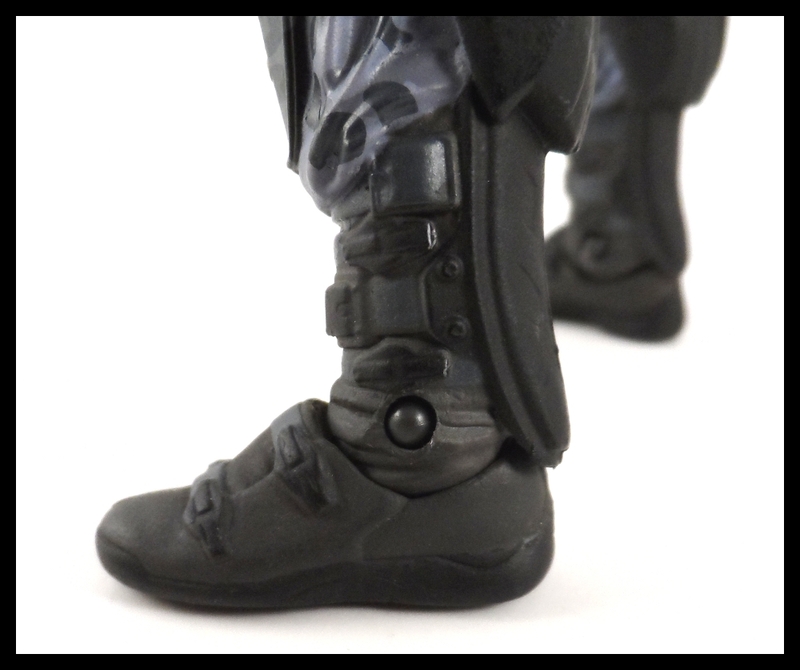 Here you can see the pad on the back of the leg juts down over the articulation point. This means that the feet can never point their toes downward. 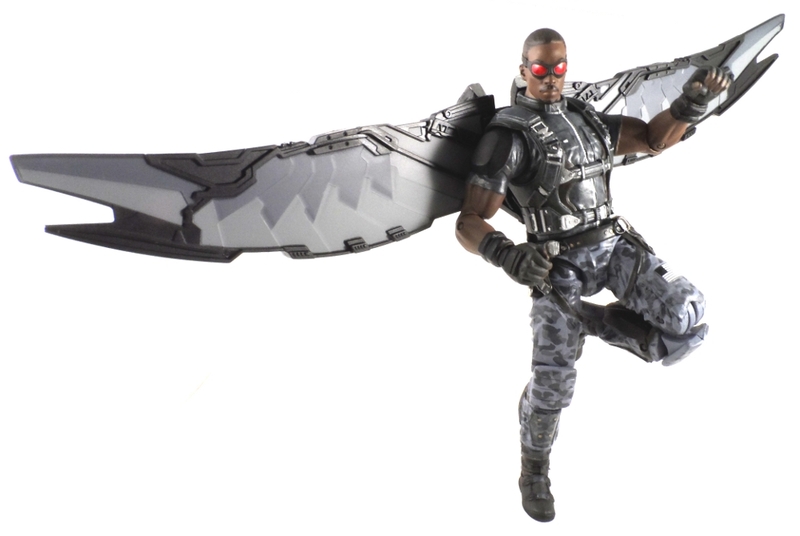 I don’t know if this was done to be screen accurate or to add stability to the ankles due to the top heavy nature of the toy (The figure is fairly top heavy and it makes the joints seem very wobbly when posing on one foot) but it’s a pet peeve of mine when a flying figure can’t point their toes down in a natural flying pose. 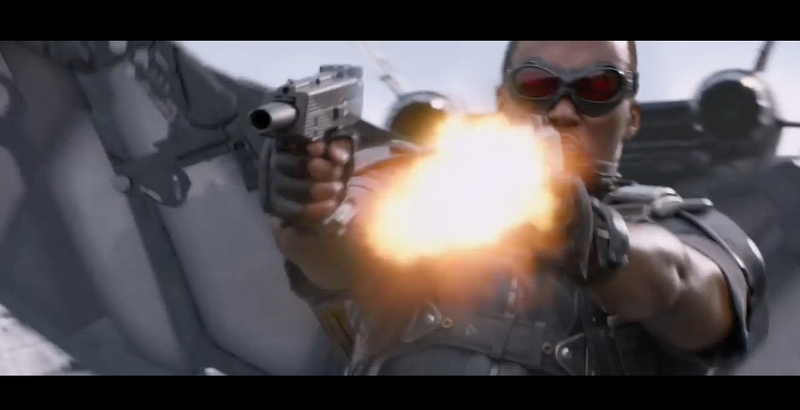 Now my other issue, seen here is a still from the Captain America trailer showing Falcon in an action stance while fighting the Winter Soldier…..